But don’t the Catalans have the right to vote for independence if they want to? It is commonly thought by independence supporters in Scotland that there is a right to hold a vote on independence whenever they want. But this is not the case. While the SNP’s Fiona Hyslop argued that “the people of Catalonia must have the ability to determine their own future” she was apparently unaware that the so called right to self-determination does not apply to places like Catalonia nor indeed to Scotland. This is why the UN sought "solutions within the framework of the Spanish constitution and through established political and legal channel" rather than pointing out that Spain was in breach of international law for not giving the Catalans their right to secession. Places like Catalonia and Scotland, being part of a fully functioning democracies already have self-determination. They have national and regional elections by which they can already express their political views. There is not in international law a right to have a vote on independence. If there were then most of the democracies in the world including all of the EU, USA and Japan would be in breach of international law. If Catalonia was merely fulfilling its right to self-determination in law and Spain was acting illegally in thwarting this right, why is it that the whole world took Spain’s side with only a few regional assemblies and rogue secessionists backing the Catalans? It's rather odd than only these few places should correctly understand international law, while the whole of the rest of the world including the UN does not. The sovereign nation state in international law has the right to defend itself and defend its territorial integrity. It is for this reason above all that we support Ukraine as opposed to its breakaway regions of Crimea, Donetsk People's Republic and the Lugansk People's Republic. They too unilaterally declared themselves to be independent from Ukraine on the basis of illegal referendums. They too received next to no recognition. Even if Russian troops had not been involved in achieving these declarations of independence and even if 100% of the populations of these regions had wished to leave Ukraine, it still would have been within the right of Ukraine to say “No” you will remain part of Ukraine and the sovereignty of the Ukrainian Government will forever extend over you. Another great blog. Perspective is everything. It is indeed ... up to a point, Lord Copper. Go away. You are not wanted here. I will delete your comments. Serious crimes should carry serious punishments with a deterrent factor. I think she should be handed a prison sentence - although nothing like the thirty years that has previously been talked about. If the prize for attempting the break up of a country is to live out the rest of your days in genteel St Andrews in a cushty job, then I fear that Spain will not last 20 more years - and neither will any other western nation with significant separatist movements. I see you have finally lost it with Running Man, Effie. Spare a thought for him though - what's he going to do with his spare time now? I don't normally comment, but I appreciate those who do. I do this for fun. Getting called a fascist for making a reasoned argument is not fun. Of course, a genuine fascist would have this lady put to death, rather than exiling her or giving her a tokenistic custodial sentence. Guys like RM are so busy throwing the word 'fascist' at everyone they don't like, they've forgotten what a true fascist is. The Spanish government must try those who carried out these illegal acts. It is necessary to uphold the rule of law but lenient sentences would make the point without creating martyrs. One problem with this proposition is that it does not account for the increasing number of people in captivity without having been tried, let alone sentenced. Back to the drawing board for you, Aly S! 'High treason' as a rendering of 'Hochverrat' is something of a category error. The Kingdom of Spain will need to brief an advocate of quite fæcal thermic intensity (to bowdlerize a popular expression) in order to make this one stick (as it were). Doubtless, whatever decision the judge of first instance may make, the losing party will appeal. This will be *very* interesting indeed. At the moment, it looks as if the Partido Popular plan for dismantling Catalan institutions, and reducing the use of the Catalan language with a view to its eventual elimination, is proceeding pretty much as intended. Other European governments are making the right noises, and Spain's undermining of the rule of law is being winked at to a degree not tolerated when it happens east of the Oder or south of the Danube. Corsica is not entirely irrelevant, of course, but the issues there arise from very different causes. Rajoy has been harrumphing about separatist tendencies in other European states: this would be for public consumption, of course, but he must have raised all this beforehand during coffee breaks. Rajoy is no fool, and although no other European state has so much as raised eyebrows at the steady dismantling of the 2006 Statute, he would certainly have ensured that he had the green light before putting the boot in. In order to obtain the execution of the warrant, the Kingdom of Spain will need to satisfy the Court that President Puigdemont's actions conform to the indicia of the offence of Hochverrat. These would include things like inciting the Armed Forces to mutiny, say, or torturing and shooting a Head of Government. This will prove rather a knotty one, I suspect. One of the charges, according to the German media, would be rendered as'Auflehnung'. This is rather less precise than 'Verrat', and will be much harder to show. If President Puigdemont's brief senses that the Kingdom of Spain are managing to substantiate the relevant indicia, my money would (were I a betting man) be on his invoking Article 20 (4) of the Basic Law. The Prosecution Office has declared that it favours the extradition of President Puigdemont. Hot on the tail of this headline-grabber, I'm breaking two equally resounding scoops, viz., that the Bishop of Rome subscribes to the Decrees of the Council of Trent, and that certain tree-climbing mammals of the genus Alliropodes are not known to be frequent users of comfort stations. Thankfully, Catalonia has no recent tradition of sustained armed insurgency, and President Puigdemont has emphasized this in messages to supporters. I hope that President Macron bears Catalonia's exceptionality in mind when he next responds to approaches from the Corsican authorities. The Scottish independence campaign was forty years too late - I recall my dad, a steel worker in a Glasgow factory, bring offered a huge wage increase to relocate to Aberdeen when the oil boom occurred. That was the time for the SNP to strike, but they were neither properly organised nor seriously promoted. Interesting point. My recollection, however, is that the SNP did indeed enjoy a certain resurgence around that time. They got about 30% of the vote and 11 seats in one of the 1974 elections. That was their best record until 2015. It lacks class to simply take off as soon as you come into some wealth, having previously relied on others to help you out. The richer parts of a country bail out the poorer parts. Just now it's the South East of England that bails out nearly everyone else in the UK. But, in fifty years time - who knows? The shoe may be on the other foot. But I do know that if the rich parts of countries simply abandon the poorer parts, then we wont have countries - and as countries form the basis of our security and wellbeing as humans then we wont have that either. Professor Ponsati's case, on the other hand, is rather different from President Puigdemont's. Without delving any further than Effie into matters now subject judice, and outwith the procedural flaws for which the Spanish judicial system has made itself proverbial, I can think of two solid grounds for rejecting the EAW. Thank you for your reminder, Aldo, and for your ingenious interpretation of the political economy of Southeast England. Yes, it was indeed brown trousers time for many chaps in London -and, indeed, in several other cities in what our Welsh friends used to call the Island of the Mighty. One particular difficulty to be faced by the Kingdom of Spain is that its Government has explicitly demonstrated over recent years that they have their knife into Professor Ponsati precisely because of her political opinions. Were she to feel a little naughty (which I trust she wouldn't) she could argue that she had to take up a governmental post in order to exercise her rights as defined in that excellent document drafted by the great Scots jurist known to my Welsh friends as Dai Bananas. You can think, you can say - but you cannot do. Ponsati, Puigdemont and pals were free to campaign and lobby for an independent Catalonia for as long as they wanted. But when they made a unilateral declaration of independence they passed from being an inconvenience that must be tolerated to being criminals. Now that they have broken the law, the next step is punishment. If I breached some obscure financial law and then skipped to Germany, I'd be on the return flight of the same plane. These guys committed high crimes against the state and get told they can go on their way. There was a Lord Justice Clerk who declared anent the contemporary increase in demands for civil and religious liberty, "Bring me prisoners, and I will find you law." His Honour Judge Llarena has taken this logic [stet] one step further, and dispensed with any trial before he locks up the kind of public representatives that the Caudillo would have had shot or garrotted. If he continues to reduce the number of independentist MPS with such earnest abandone, the belief of Ines Arrimada (Catalonia's answer to Ruth Davidson) that she has won the elections will become true. It rather looks this afternoon as if the PP were planning to offer the Federal authorities some sort of exchange of prisoners: our Catalans for your whistle-blower. Logically enough, the court in Schleswig-Holstein has rejected the head of accusation rendered as High Treason' and released President Puigdemont on bail. And of course he isn't a flight risk at all is he? Time for Spain to turn the tables on fellow EU nations who refuse to extradite traitors - any criminals from elsewhere who make it to Spanish territory will be provided safe haven, just like the old days, until the traitors are returned. Evidently, the court is not of opinion that President Puigdemont will abscond, and so you are probably right. I perceive that you are of the Red Queen school of jurisprudence: the Federal Republic of Germany, however, is very much a Rechtstaat. The Article of its Basic Law to which I referred above would have enabled this gentleman, had he been Minister-President of a State in analogous circumstances, to raise a defence. However, the Basic Law would quite simply not have permitted the Federal Government from conducting itself in the appalling manner of the PP. 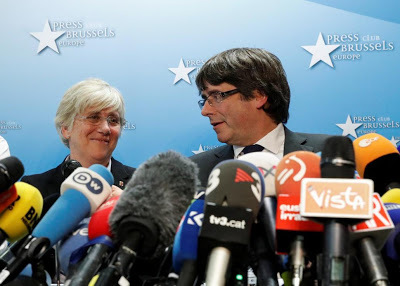 Informed observers note that President Puigdemont, in his appeals to the civilized European public, predicates his discourse, not on the right to self-determination, but on the Rule of Law. While this concept will be opaque to the fellow-travellers of tyranny and oppression, they are not the audience which he is addressing. It seems to me to be yet another nail in the coffin of the European Union. There is a Europe wide extradition agreement in place - but it doesn't function. What sort of union is this where you can break the law flagrantly in one part, abscond to another, and then not even be remanded in custody? I'd like to see Puigdemont sent down for the rest of his life - but if his freedom further damns the European Union then I'm glad of it. I have just been informed that the Kingdom of Belgium is to initiate proceedings against the Kingdom of Spain for conducting illegal espionage operations on its territory. It would be interesting to be a fly on the wall in Borgen these days! The Rule of Law is in even greater danger south of the Pyrenees than it is to the east of the Oder and the south of the Danube: if Rajoy et al. continue to get away with this wrongous course, it will be very bad news for all of us - including those who erroneously style themselves conservatives. The inaccurate assertions of Chancellor Merkel's spokesman concerning the hopelessly-compromised Spanish legal system will confirm the belief of the most dependable observers of German public life that, whatever her personal beliefs and feelings, she is first and foremost a trimmer. Happily, the German judicial system is deeply committed to the rule of law. Unlike the 123rd President of Catalonia, the 130th President will not be summarily thrown into the hands of the enemies of justice and freedom. For the time being, President Puigdemont will only need to report to the police once a week. This case will involve long and detailed argument on some highly technical issues, as well as clear issues of rights and basic legality. I urge all fair-minded people to follow it closely and dispassionately. As for Professor Ponsati's case, the 'evidence' presented, despite its inordinate length, lacks detail that might plausibly link her with acts equivalent to any offence known to Scots Law. Her legal representative is quite right to denounce this as an abuse of process. Furthermore, many of the allegations presented to the Court would seem to relate to the actions of other Ministers, and not to those of the President. Judge Llarena is once more confirming the widespread belief that he owes his position to family and political connections rather than to any learning in the LA. I beg your collective pardon:that should read ' Learning in the Law'. A couple of points are in order before we leave this topic. Professor Ponsati was, doubtless, flattered when a Cabinet Minister said that persons with her opinions should not occupy academic posts. Nevertheless, seeking employment abroad thereby became her most viable option. It is therefore entirely proper that her University should defend her. In recognition of this, my family has and a modest contribution to the fund for her legal expenses. Given the merry abandon with which the Spanish Government is dishing out terrorism charges (e.g. for possession of a whistle - this one, however, subsequently reduced (quelle delicatesse!) to riot), the PP régime and their fellow-travellers are clearly abandoning even the pretence that the Spanish State is a Rechstaat: the rest of us would do well to concur with them. This truly *is* my final observation. It emerges that the Spanish Treasury Minister admits that the Independence Referendum involved no use of public funds. He added, however, that any such misuse discovered in the future would be severely punished. I cannot see this cutting much ice when President Puigdemont's case comes to court. In the FRG, as in any jurisdiction where the Rule of Law prevails, evidence is required *before* any proceedings are initiated. If this farce continues, Judge Llarena might try accusing the President of the Spanish equivalents of Wearing a Loud Jacket in a Built-up Area During the Hours of Darkness, or Looking at Me in a Funny Way. Mea culpa ... Effie might consider putting in for the newly-announced Palacio de Vilana Prize. €12,000 would be jolly useful, I've no doubt. Details c/o any Spanish Consulate.